There was a day, not to long ago, when locally produced entertainment television wasn’t such a rarity in Maine. In an effort to revive the production of local shows, Maine’s only late night talk show, “The Nite Show with Danny Cashman,” is returning to broadcast television after an eight-year hiatus. The show, in formats made famous by Johnny Carson and David Letterman, will air at 11:30 Saturday nights beginning Oct. 16, on WABI-TV 5. It also will run in Portland for the first time, airing on WPME-TV 35 midnight on Saturdays. Old Town native Dan Cashman was having a sleepover at age 9 when he first saw Letterman interviewing movie critics Gene Siskel and Roger Ebert on TV. By the time Cashman entered high school, he was resolved to host his own show. In 1997, 19-year-old Cashman began “The Nite Show” on Bangor’s then-WB affiliate, WBGR-TV. For two years, Cashman brought in guests such as radio personality Don Imus, The Wallflowers band and local celebrities. In 2001, it came back to television on Bangor’s then-UPN affiliate WCKD-TV and continued for another year, ending on their 150th show. The crew is more experienced, has greater connections for prospective guests and is appealing to a broader market. Guests such as Gov. John Baldacci, television journalist Susan Kimball, University of Maine hockey coach Tim Whitehead and comedian Gary Crocker of West Gardiner are lined up for the first few shows. Cashman’s goal is to make each guest genuinely laugh at least once. During the first taping on Wednesday, guests engaged in a light-hearted conversation with Cashman, revealing a side of them not usually captured by the media. “I tell ya, I had the most fun throwing things out in front of cars,” said Kennedy, referring to a skit he had recently done for the show. But Kennedy doesn’t do all the grunt work. In a recently taped skit, Cashman gets a pie in the face. From Cashman’s research, he has learned that people of all ages watch late night television for different reasons. With that in mind, he’s building a show that will appeal to a broad audience. “I began to think that maybe there’s a market for this again, and I hope I’m right,” Cashman said. Despite his resistance to the idea, all of the pieces started to fall into place. WABI-TV 5, the No. 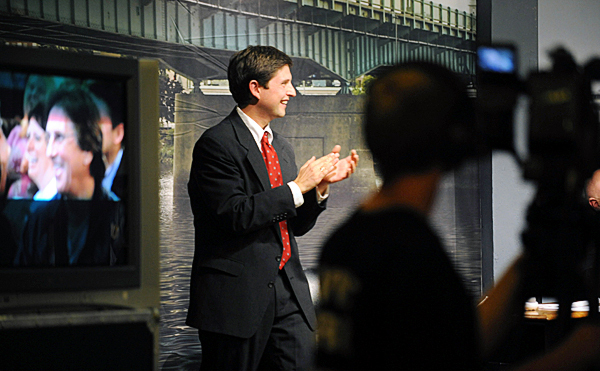 1 television channel in Bangor, was “overwhelmingly supportive” and agreed to air Cashman at 11:30 p.m., prime time for late night television. The New England School of Communications, which is shooting the show with five cameras, offered the quality Cashman was looking for. From 1997-2002, the crew usually filmed the show on a camcorder. The fact that students would benefit from the project by gaining experience was an extra incentive for Cashman to go forward with the show. To add an artistic flourish, house band Jump City Jazz Band composed a new theme song for the show and presented it to Cashman during their first filming. The band – Brian Catell on the keyboard, Michael Borja on the drums, Brian Nadaeu on the trumpet and flugelhorn and Bob Roman on the bass — will perform each epi-sode. 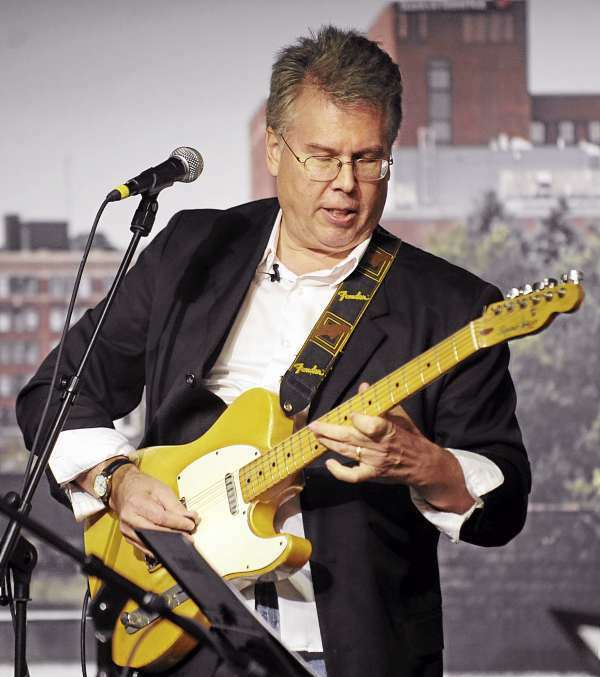 He envisions the show being a bridge between Maine talent known in Portland and Bangor. For example, Maximum Blue, a father-son duo who plays music on the streets of Bangor, performs in a show that will air in November. 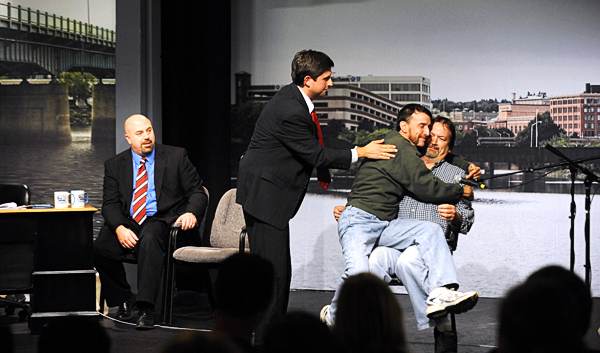 The show is taped before a live audience at the Next Generation Theatre in Brewer at 6 p.m. on chosen Wednesdays. Seats can be reserved at www.theniteshowmaine.com. Thomas Morelli of Brewer photographed the backdrop, a cityscape of Bangor from across the Penobscot River. In addition to snacks, the theater’s bar also serves wine and beer. A special preview show titled “Road to the Nite Show” will air at 11:30 p.m. Saturday, Oct. 9 on WABI-TV 5. “The Nite Show with Danny Cashman” is a production of Cashman Communications, in association with Community Broadcasting Service. 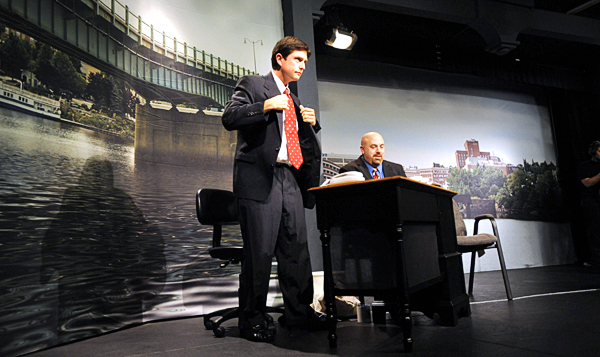 For information, show clips, extras and polls, visit “The Nite Show” website at www.theniteshowmaine.com.